The University of Maine Cooperative Extension is seeking sheep farms with footrot to participate in an applied research project funded by Northeast SARE. 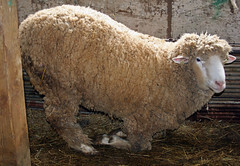 The project is in its 4th year and has already gathered data from approximately 1,000 sheep in the northeast. The researchers are seeking data from additional flocks to determine if a genetic marker can be identified for possible resistance to the footrot. If you have footrot in your flock and would like to participate, please contact Principal Investigator Richard Brzozowski at richard.brzozowski@maine.edu or (207) 951-7155.